With the silly season behind us, it’s time to start nailing your social media planning for 2019. 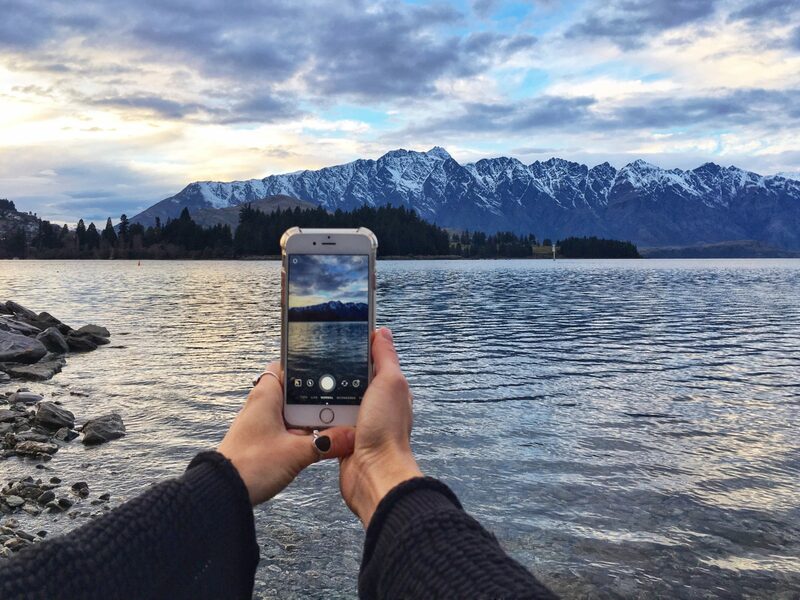 To get you started, we’ve created a downloadable 2019 Queenstown Social Media Holiday Calendar to make sure you’re utilising trending holiday dates for your social media content. From NZ Conservation Week to Māori Language Week to World Chocolate Day, there are a plethora of worldwide celebrations that you can take advantage of. To get you started, we’ve compiled New Zealand holidays to help you fill your content calendar in no time. Email [email protected] for your downloadable calendar or bookmark the list below. Social media – it’s all-seeing and all-powerful but can be an almighty waste of time and money if you dive in without a plan. To reap the rewards of social media you need to build a clear strategy outlining goals, audience, competition and content. Like any business plan the first step to creating a social media strategy is to establish goals, giving you the ability to measure your success and return on investment. Pro Tip: Align your social media goals with your overall business and marketing strategy to show some more ‘old school’ execs the true value of social media. Broad business goal: to grow my business. Social media SMART goal: I will acquire 300 new followers on Instagram within two months by engaging with followers, running a paid Instagram advertising campaign and networking with local businesses. This will enable me to grow my business and increase my revenue. For your social media strategy start by assessing your business goals and writing a social media SMART goal to align with each one. It may seem simple, but do you really know who your audience is and where they’re active online? Is your Facebook audience different to your Instagram audience? Knowing what your audience wants to see on social media is key to a successful social media strategy. You need to craft content that appeals to your specific audience, so they’ll like, comment on and share your posts. Most social media platforms offer great (and free – YAY!) analytic tools that show detailed insights about your audience. Familiarise yourself with their age, location and when they’re most active online to create ‘personas’. These personas will help you visualise your audience as real people (rather than numbers) and help you cater to their actual interests, passions and needs. It’s time to start gathering data. How are they engaging with their followers? How many followers do they have and how quickly are they growing? What time do they post? Choose three key competitors and complete a SWOT analysis to help you understand your competitive advantage and how you can ‘outplay’ your competitors online. Pro Tip: use competitors as your inspiration, but don’t copy. Chances are they have you listed as a competitor too, so remember you still need to be unique and authentic with your posts! Perform a social media audit to review what’s working and what needs improvement on your social media channels. Check for consistency, do all your channels have the same consistent tone and content? If you’re serious about your social media strategy, investing in social listening software can save you time and money. Platforms such as HootSuite, Sprout Social, Zoho Social, Mention, Meltwater etc make social listening a breeze and can help you track trends, monitor competitors and compile data among many other handy tools. Each platform has pros and cons, so do your research before committing to buy. Build a mission statement for each of your social media platforms. This enables you to take the data collected above and create a short statement that outlines exactly who we are and what we do. [Business name’s] [social media platform] is where [audience] finds [content] to [benefit]. Pro Tip: this should be brief, where we went into detail above about audience and content, here we need to rein it in. Building company: Bob Builder’s Facebook page is where local Queenstown homeowners find inspiring images and video content to help plan for their new home. Cafe: Corner Café’s Instagram is where young New Zealand-based foodies and coffee lovers find fun, creative and colourful images that inspire them to visit and encourage ‘regramming’. Mum blogger: Diana’s Diary Facebook page is where young mums across the world find helpful tips and funny anecdotes to encourage conversation and engagement with each other. Bank: Frank’s Financial LinkedIn profile is where entrepreneurs and business owners find useful information, advice, insights, resources and inspiration for running and growing their businesses. It’s time to start building your content calendar. Make sure your content and calendar reflect the mission statement you’ve assigned to each social profile so that everything you post is working to support your business goals. Keep your content aligned with your audience, always ask yourself who the content is for, and how they should interact with it. Pro Tip: As a rule, 80% of your content should be fun, informative or entertaining and only 20% should directly promote your brand. Hurrah! You have a stellar social media calendar, followers have quadrupled, videos have gone viral and your boss gives you a high five every morning! This hasn’t happened for you yet? Don’t worry, you probably won’t get your social media strategy 100% right on the first try (this happens with all business plans), simply monitor what works and adjust your strategy accordingly. Continue with your social media auditing, schedule in weekly, monthly or quarterly as desired and re-evaluate your SMART goals. Sounds like a lot of work? The truth is, building a successful social strategy isn’t a five-minute job, and in today’s online world it’s one of the most effective marketing tools around. Need a hand? Get in touch to find out how we can help create a tailored social media strategy for your business! Let’s talk Instagram Stories. Most of us watch them, but do you use them for your business? With over one billion monthly active users*, Instagram’s popularity and growth continues to skyrocket. As savvy business owners, we need to stay ahead of trends and learn to communicate with our audience on their level. One of Instagram’s most popular tools, their ‘Stories’ feature has over 300 million active users and is basically a free marketing tool. 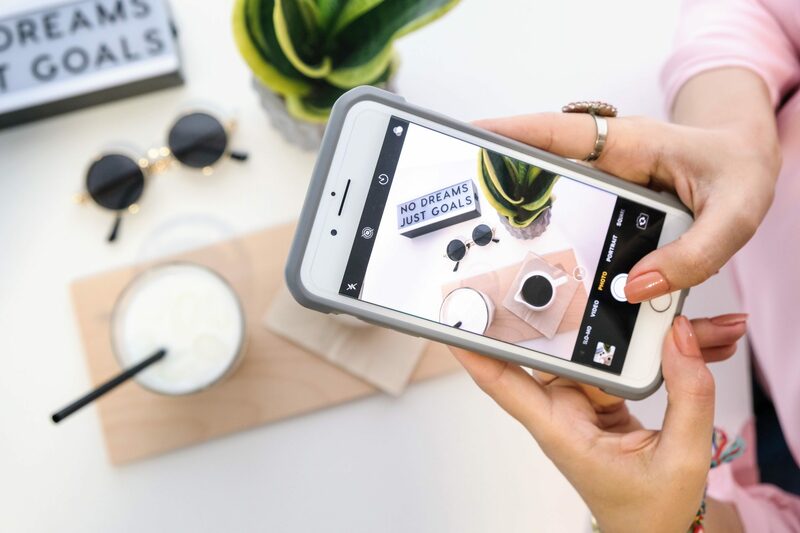 When used correctly, Instagram Stories can be more advantageous than traditional advertising, so here’s how to make them ‘work’ for you. It’s important to acknowledge that your audience wants to see two very different things from your Instagram. Firstly, they want to see an ‘on-brand’, gorgeous, well-thought-out feed. Secondly, they want to see an ‘insider’s perspective’, something the average person won’t see. Because Instagram Stories only last for 24 hours, businesses can present an unembellished, real-life look at what goes on behind the scenes. Since Instagram updated their algorithm in late 2017, it’s much harder for your brand to be found if you only post to your feed. Stories on the other hand always appear at the top of a follower’s feed and helps your brand remain visible. Popular Stories also appear at the top of the Explore page, and if you’ve tagged a location it appears in location-based Stories automatically compiled by Instagram, helping your profile gain an even wider reach. What should I put in my Stories? They’re called Instagram Stories for a reason. If you’re boring, people won’t come back to your feed for more. Behind the scenes – Show your business has real people with personalities. Give your audience an insider view into your brand, who are you and what you represent. Use stories to get real-time feedback – Question your followers about a new product or idea using Instagram’s poll feature. This provides you with live feedback and makes your audience feel valued. Collaborate with other brands – Find likeminded brands and work together on a project, event or giveaway. Create live tutorials – Use your Stories to give advice, make ‘how-to’ slideshows or answer FAQ’s. Try an Instagram takeover – Hand over your Instagram account to someone else for a day or two. This could be your CEO or a special guest (think influencers, local photographers etc). This gives a different voice to your account and shows a new and exciting perspective. Take your e-commerce to the next level – Bring your ‘shop-able’ looks to life using your Stories. With Instagram’s rollout of new Shopping Tags, which enable businesses to link to their website using price and description tags, you should be looking at how to best optimise your e-commerce capabilities. Back in December 2017, Instagram released a new ‘Highlights’ feature that has changed the way people interact with the platform. It enables you to select a series of Stories and feature them below the bio section of your profile. NOTE: THIS IS SIGNIFICANT FOR BUSINESSES! Instagram Stories Highlights gives you the ability to have unlimited links for an unlimited time in your bio (a clear departure from the 24-hour Stories format we have previously seen). This means you can now direct your followers to any number of external pages like your website, an event, other channels etc, through a simple tap. The placement of Story Highlights allows you to go beyond the 150 of character limit of your bio to show people what your account is all about and why it’s worth a ‘follow’. Airbnb’s Travel Tuesday series showcases user-generated content from Instagram to provide its followers with inspirational travel ideas. Rather than just posting the pictures, Airbnb transforms each photograph into an interactive quiz. 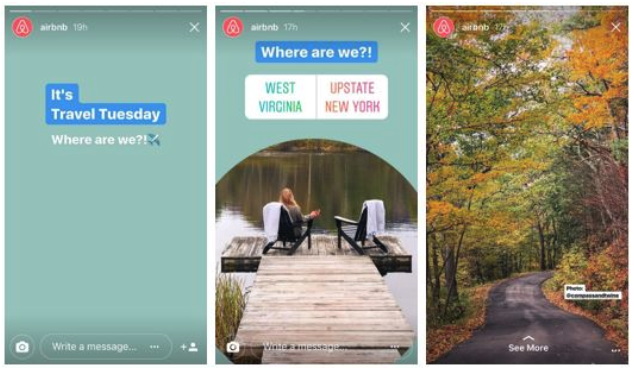 By incorporating user-generated images and polls into their stories, Airbnb increases engagement and creates ways to measure their followers’ interests at the same time. E! 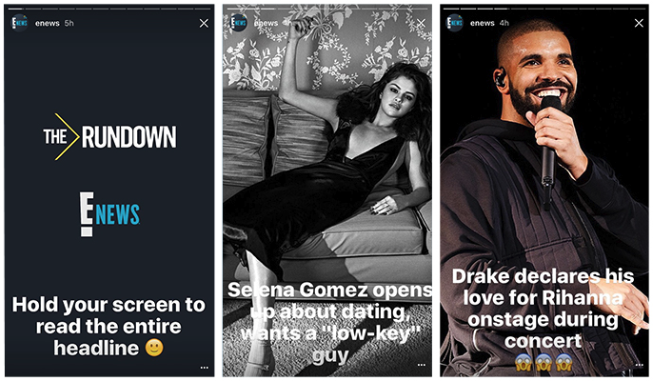 News keep their followers updated on the latest celebrity drama by sharing news stories directly on Instagram Stories. These ‘short but sweet’ news blasts meet the needs of their target audience, who may not want to read a full article, but always want to be on top of the latest celebrity news. 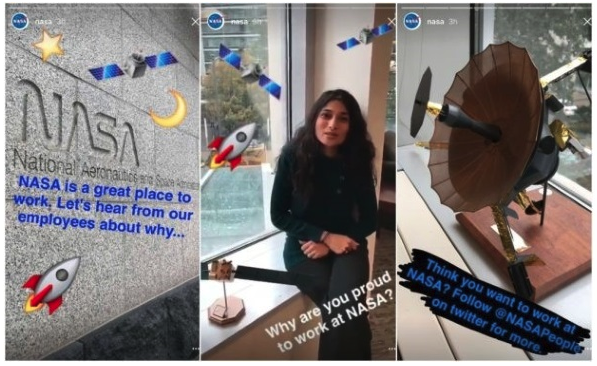 NASA uses their Instagram Stories to share ‘behind the scenes’ news and information. They provide background stories, additional information, research and visuals that complement their regular Instagram posts, giving their followers a ‘backstage pass’ to the inner workings of NASA. Instagram is constantly evolving and keeping your pulse on new trends and tools is vital to creating a successful social media strategy. Understand the importance but don’t know where to start? We’ve added an Instagram Stories Workshop to our portfolio, so if you think your business would benefit upskilling in Stories then get in touch today.